Math IS Fun and Games! Classroom routines are FINALLY in place and automated (more or less. 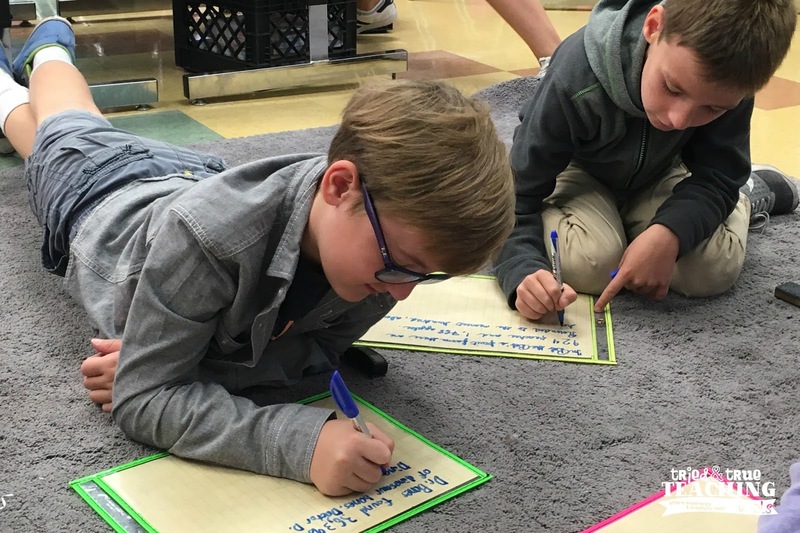 . .) We spent the first three weeks of school developing a growth mindset in mathematics, based on the curriculum of Stanford University professor, Dr. Jo Boaler. The emphasis during those three Week(s) of Inspirational Math was on problem solving, the visualization of mathematics, and making connections between representations and ideas. All I can say is WOW! Students were empowered and refer to themselves as mathematicians. Be sure to check out YouCubed to learn more! 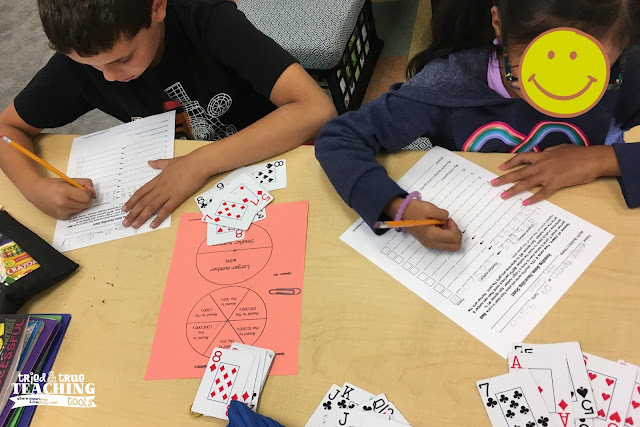 Math Workshop is now in full swing, and with that comes math games and task cards for students to practice and master concepts independently and with partners, while I work with small groups. We began with place value and rounding. I no longer assume my students come with number sense; we play plenty of hands-on games to reinforce place value concepts. Be sure to follow me on Instagram to see math workshop in action! You can read more about differentiated math menus here and managing math workshop here. One of the partner games my students love to play is a card rounding game. Unlike most games where the largest number wins, in this version, students draw cards then place them in any order to form a number. 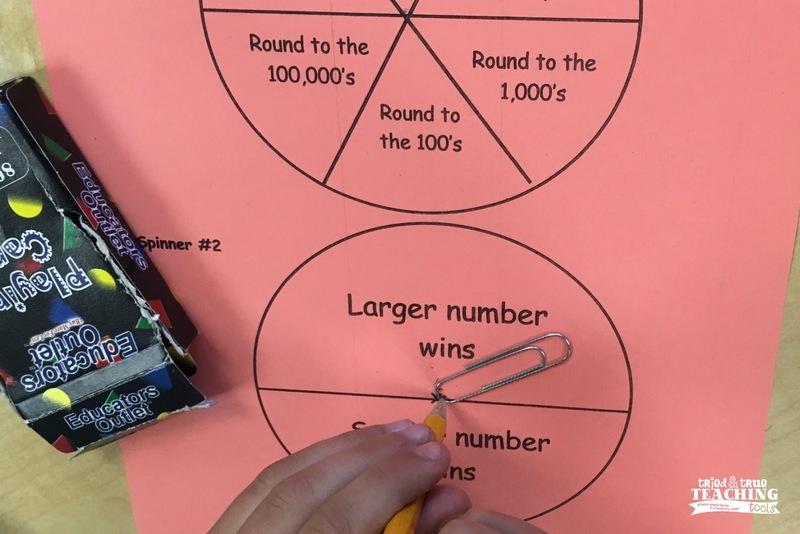 After spinning the spinner to determine which place to round to, a second spinner is used to decide whether the greatest or least number wins. Kids love the anticipation of the spinner! You can download your copy HERE. 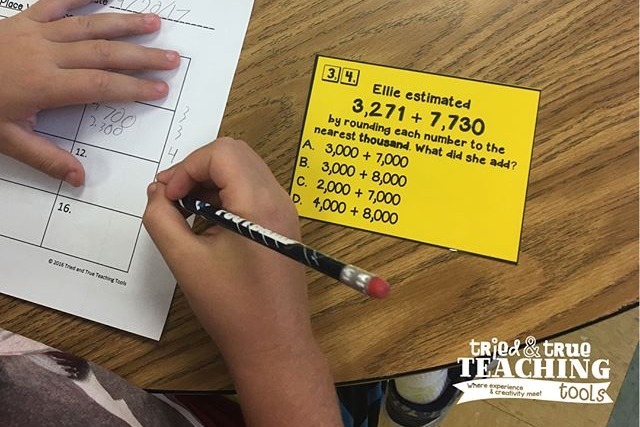 Even though students hate drill & kill math worksheets, they enjoy solving equations in the form of task cards! These rounding and estimating task cards help to familiarize students to the language and format of test prep questions. They can be used as a math center, during math workshop, or as a whole class SCOOT game. The best part is that students can work independently, giving the teacher time to work with small groups of students or to confer one on one. Check them out HERE or by clicking on the picture below. 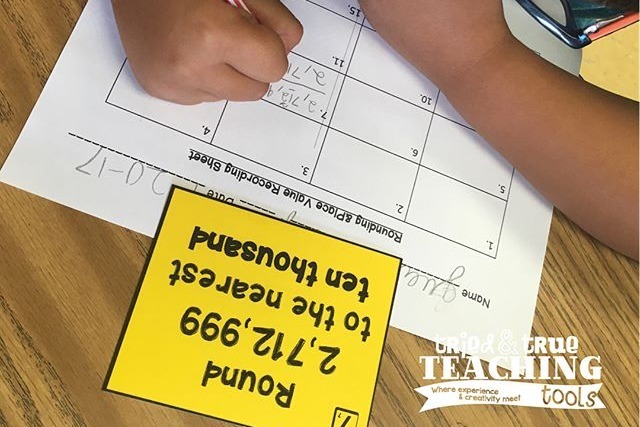 Learn about another fun, no-prep place value game HERE. What are some tried and true activities you use to reinforce math concepts (that students can do independently)? Be sure to visit the blogs below for more great teaching ideas! I always feel as if I've visited your classroom when you post! I so agree that we should never assume that kids enter with number sense, even in the upper elementary grades. I love hearing that your kids now think of themselves as mathematicians - so important as they approach new learnings! Thanks for another sweet glimpse inside your teaching life! Thanks, Retta! I love hearing them talk about math and "borrowing" other students' strategies. I love your math workshop set up! I agree about kids loving task cards. They don't seem to think task cards are work at all. It's all in the presentation. Thanks! I'm still experimenting with my workshop formats and wanting to incorporate CGI strategies. . . stay tuned! Love this Kathie. 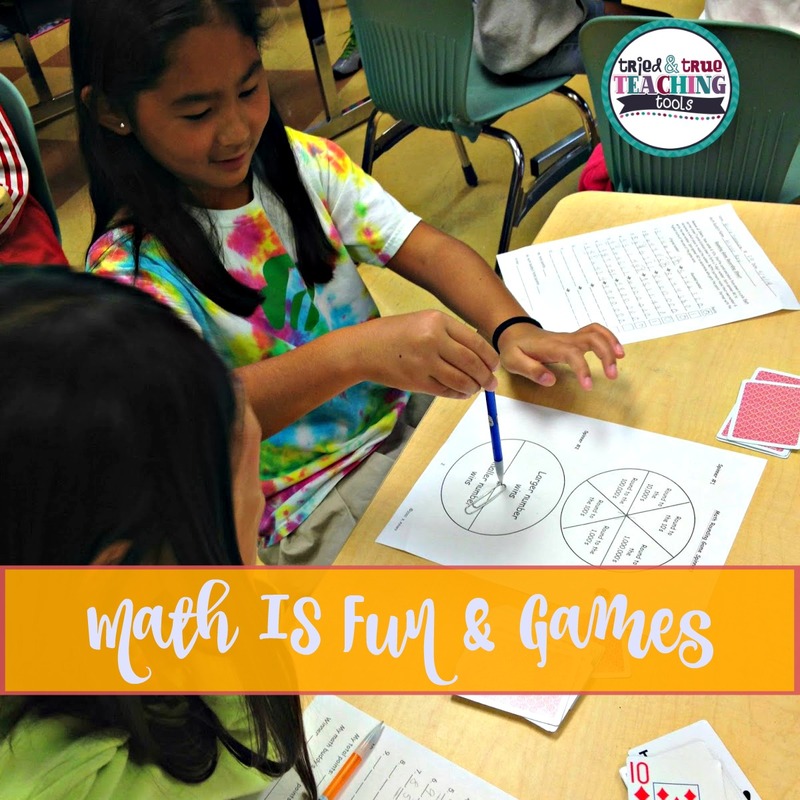 Math is so much more fun when you're playing! Math games are one of my favorite ways to introduce, teach, and review concepts. Reading your post makes me wish we taught together. We'd have so much fun. Your games are amazing. Thanks, Tracy! I always feel the same when I read your posts. Wish we were closer, although wouldn't it be fun to brainstorm a way to connect our classes? Think on this! Your math workshop seems fabulous! I want to try some of your activities with my own students! Thank you for sharing this. Thank you! Math workshop has changed my use of time during math & my students are so motivated now! You can always email me with any questions or if you need any workshop ideas, etc. These activities are great! I think kids love task cards and it's not a lot of prep. Thank you for sharing this! Thanks, Sally! Yes, I love the no-prep aspect of task cards, too! You make math so much fun. As a kid, I just didn't get math, to this day it scares me. With teachers like you, your students will NEVER feel the way I did. Thanks so much for sharing your awesome ideas. Awww, thanks, Deann. I struggled with math as a kid, too, so when I became a teacher, I was determined to make it fun and understandable for my students!